The Duchy of Lancaster is one of the two Royal Duchies in England, the other being the Duchy of Cornwall, and is the personal (inherited) property of the monarch. The Duchy of Lancaster was created for John of Gaunt, a younger son of King Edward III of England, when John had acquired its constituent lands through marriage to the Lancaster heiress. As the Lancaster inheritance it goes back to 1265, when Henry III granted to his younger son, Edmund (Anton's 22nd Great Grandfather), lands forfeited by Simon de Montfort, Earl of Leicester. In 1266 the estates of Robert de Ferrers, 6th Earl of Derby, another of the protagonists in the Second Barons' War, were added. In 1267 the estate was formerly granted as the County, Honour and Castle of Lancaster. In 1284 Edmund was given the Manor of Savoy by his mother, Queen Eleanor (Anton's 23rd Great Grandmother), the niece of the original grantee, Peter II, Count of Savoy. 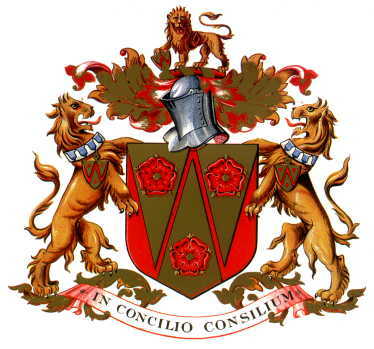 King Edward III raised Lancashire into a county palatine in 1351, the then holder, Henry of Grosmont (Anton's 20th Great Grandfather), Edmund's grandson, was made Duke of Lancaster. After his death a charter of 1362 conferred the dukedom on his son-in-law John of Gaunt, Earl of Lancaster, and the heirs male of his body lawfully begotten for ever. After Roman withdrawal from Britain in the fourth century AD, the lands of Lancashire returned to what they had been before, populated by a now Romanised British people of the tribe known as the 'Cumbri' (from which Cumbria is derived). 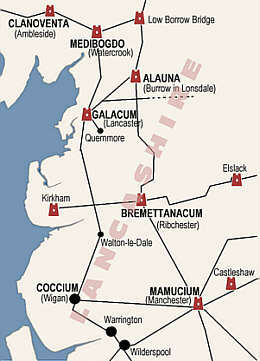 They spoke a Celtic dialect, similar to Welsh, and this is reflected in many Lancashire place names. For example, places ending in the suffixes "-keth", "-cheth" or "-teth", (as in Penketh, Toxteth, Culcheth, Tulketh), reflect the old Welsh "coed", indicating a large wood or forest. The Celtic word "penno", meaning a hill, is reflected in places like Pendle. Beesley, Beasley, Beazleigh, Beazley, Beisley, Bezley, etc., is a locational name from Beesley in Lancashire, perhaps a compound of the Olde English pre 7th Century "beos" meaning "bent grass" plus "leah" a wood or clearing. The name is now widespread in the West Midlands and elsewhere, as well as in Lancashire. The surname dates back to the mid 13th Century. Although "Beesley" is the original spelling of this surname, the form "Beasley" is most frequently encountered. It is derived from a place-name in Lancashire. Although it is often merely shown on most Maps as "Beesley" larger scale versions reveal that it is, in fact, two places: Higher and Lower Beesley. The first is the bigger and, is linked with its counterpart by a footpath, ¼ mile long. They stand to the East of the M6 Motorway, the nearest locating-point being Inglewhite, 8 miles North of Preston. About 2½ miles West is "Beesley' Farm" a small settlement, somewhat isolated, in the vicinity of Bilsborrow and between the M6 and A6 Highways. The second unit of "Beesley" (-ley) occurs in countless English place-names and can be traced to an Old English word "loh" which means a "grove". In much earlier times the greater part of the landscape was shrouded in dense woodland beneath the shadows of which little could grow or be cultivated. Where thinning had taken place, either naturally or by felling, light was admitted and vegetation flourished. Penetration of light was so very exceptional that it influenced the creation of the vocabulary which was related to "open spaces". This is particularly so in Latin, where the words for a "grove" and for "light" are seen to be closely related: "grove" is "lucus" and "of light" is "lucis". In English the word "light" can easily be seen behind the word "leigh" - though rather less so in "lea" and "ley" although they are all related. The nearest place on a map where Beesley was located is Inglewhite. The village name means 'white fire', from the Gaelic aingeal meaning 'fire'. It is thought to refer to will-o'-the-wisps that were once prevalent on the village green. 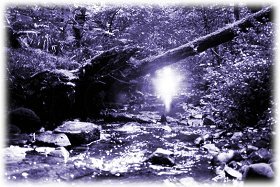 The will-o'-the-wisp refers to the ghostly lights sometimes seen at night or twilight — often over bogs. It looks like a flickering lamp, and is sometimes said to recede if approached. 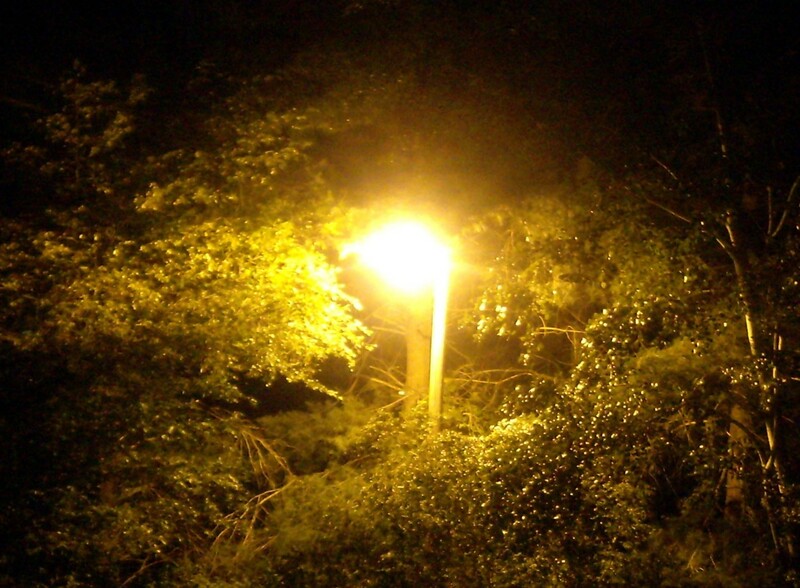 One popular naturalistic and scientific explanation for such phenomena is that the oxidation of hydrogen phosphide and methane gases produced by the decay of organic material may cause glowing lights to appear in the air. Experiments, for example, done by the Italian chemists Luigi Garlaschelli and Paolo Boschetti, have replicated the lights by adding chemicals to the gases formed by rotting compounds. More recently Professors Derr & Persinger put forward a theory that earth lights may be generated Piezoelectrically under a tectonic strain. This theory suggests that the strains which move faults also causes heat in the rocks, vaporising the water in them. Rocks and soils containing Piezoelectric elements such as quartz (or Silicon ) may also produce electricity, which is channeled up through soils via a column of vaporised water until it reaches the surface—somehow displaying itself in the form of earth lights. If correct, this explains why such lights can behave like in an electrical and erratic- or even apparently intelligent manner. Danes, Finns, Swedes, Estonians and Latvians amongst some other groups believed that a will-o'-the-wisp marked the location of a treasure deep in ground or water, which could be taken only when the fire was there. Sometimes magical tricks were required as well, to uncover the treasure. In Finland and other northern countries it was believed that midsummer was the best time to search for will-o'-the-wisps and treasures below them. It was believed that when someone hid treasure in the ground, (s)he made the treasure available only at the midsummer, and set will-o'-the-wisp to mark the exact place and time so that (s)he could come to take the treasure back. Finns also believed that the creature guarding the treasure used fire to clean precious metals bright again. The will-o'-the-wisp can be found in numerous folk tales around the British Isles, and is often a malicious character in the stories. Wirt Sikes in his book British Goblins mentions a Welsh tale about a will-o'-the-wisp (Pwca). A peasant travelling home at dusk spots a bright light travelling along ahead of him. Looking closer, he sees that the light is a lantern held by a "dusky little figure", which he follows for several miles. All of a sudden he finds himself standing on the edge of a vast chasm with a roaring torrent of water rushing below him. At that precise moment the lantern-carrier leaps across the gap, lifts the light high over its head, lets out a malicious laugh and blows out the light, leaving the poor peasant a long way from home, standing in pitch darkness at the edge of a precipice. This is a fairly common cautionary tale concerning the phenomenon; however, the Ignis Fatuus was not always considered dangerous. There are some tales told about the will-o'-the-wisp being guardians of treasure, much like the Irish leprechaun leading those brave enough to follow them to sure riches. Other stories tell of travellers getting lost in the woodland and coming upon a will-o'-the-wisp, and depending on how they treated the will-o'-the-wisp, the spirit would either get them lost further in the woods or guide them out. The lands of Beasley (the place) are located near the Cockersand Abbey. An ancient record records that one third of the Beasley was donated the monks of Cockersand, sometime around 1223. It appears one of the earliest lords of Beasley would be one Richard of Tranacre (or Tarnacre or Tarnicar). The first recorded spelling of the family name is shown to be that of Thomas de Besleg, which was dated 1246, in the "Assize Court Rolls of Lancashire", during the reign of King Henry III, known as "The Frenchman", 1216 - 1272. Richard Beesley of Yorkshire, was listed in the Yorkshire Poll Tax of 1379. The area where Beesley is located is rather close to the Manor of Mitton. Thomas de Besleg was a surety for Bernard de Mitton, so it is likey the two families are intermarried at some point. THE name Mitton derives from the word Mythe meaning a junction of rivers. The two rivers are the Ribble and its major tributary the Hodder which meet nearby. Mitton is really two hamlets split by the River Ribble. The river was once the county boundary and while Little Mitton was once on the Lancashire side of the river, Great Mitton was on the Yorkshire side. Now both settlements are well and truly in Lancashire as has been the case since the boundary changes of 1974. Therefore, Richard Beesley of Yorkshire was really Richard Beesley of Lancashire in today's geography. Goosnargh is a village on the north side of Preston, Lancashire, England. The village lies between Broughton and Longridge, and is adjacent to Whittingham. The name appears in the Domesday Book as "Gusansarghe." It is nearby the ancient Roman fort of Kirkham. Goosnargh comes from the Old Norse words gudhsins hörgi (meaning "at the idol's temple). Source: Names and Their Histories, by Isaac Taylor, Canon of York, published by Rivingtons London 1898. To the north-east of Goosnargh Chapel lies Eaves Green. Beesley is north of Eaves Green, and has Kidsnape to the east and Bulsnape to the north-east, and further to the east, on the border of Chipping, is Loudscales, overlooking the River Loud, there forming the boundary. There were six ancient divisions called tithings— Church, Beesley, Kidsnape, Longley, Aspenhurst and Threlfall. From: 'Townships: Goosnargh', A History of the County of Lancaster: Volume 7 (1912), pp. 190-206. Tosti Godwinson, Earl of Northumbria and brother of Earl Harold Godwinson, later King of England. Earl Tosti owned the lands of Preston / Goosnargh before the Norman conquest. Court records from the Middle Ages shows Thomas de Besleg and Richard Russel of Plumton as being sureties in the lawsuit of Bernard de Mitton v. Ralph de Mitton re homage and reliefs for freehold in Gusenhach. 'Roll 404: 30-31 Henry III (part 1 of 2)', Lancashire Assize Rolls: 4 John - 13 Edward I . 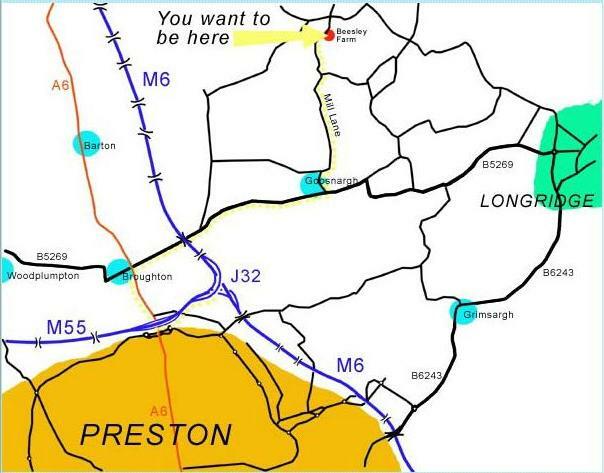 The maps of Lancaster show Goosnargh and Plumpton and Beesley all in the same small area. The area around Goosnargh was home to several Catholic families in 1608 - Keighley, Beesley, Hesketh, Marsden, Threlfall and Latewi(ys)se, and records show that various members of the Latewysse family of Goosnargh were fined for recusancy. (Also spelled Bisley). Martyr, born at The Hill in Goosnargh parish, Lancaster, England, of an ancient Catholic family; died 2 July, 1591. He was ordained priest at the English College at Reims, 14 March, 1587, and left for England, 1 November, 1588. A man of singular courage, young, strong, and robust, he was captured by Topcliffe late in 1590, and was tortured until reduced to a skeleton. He endured all with invincible courage and could not be induced to betray his fellow Catholics. He suffered by the statue of 27 Eliz., merely for being a priest. His last words were "Absit mihi gloriari nisi in Cruce Domini Nostri Jesu Christi" and, after a pause, "Good people, I beseech God to send all felicity". George Beesley was beatified by Pope John Paul II on November 22, 1987 as one of the Eighty-five Martyrs of England and Wales. The HILL was in 1600 the residence of a family named Beesley. From: 'Townships: Goosnargh', A History of the County of Lancaster: Volume 7 (1912), pp. 190-206. Francis' heir was his son George, twenty-three years old; Lancs. Inq. p.m. (Rec. Soc. Lancs, and Ches. ), i, 138. Francis' brother George, ordained at Rheims in 1587, was sent on the English mission in the following year, that of the Armada. He was captured after about two years, and though tortured to make him reveal the names of his hosts he would tell nothing, and was at last executed for his priesthood in Fleet Street, London, 1591. From: 'Townships: Goosnargh', A History of the County of Lancaster: Volume 7 (1912), pp. 190-206. From the Beesleys, the The HILL estate went to the Blackburnes, a branch of the Stockenbridge family, who were in possession in 1754. In 1653, Peter Blackburne and his wife Katherine (nee Beesley) petitioned for land. Katherine was the heir at law to Henry Beesley (late of Bleasdall) who was heir to William & Margaret Beesley of Plumpton (probably Woodplumpton). It is likely that Francis' son George Beesley fled the threat of torture in Elizabethan England, and is the ancestor of Robert Beasley born circa 1630 in Lancashire England, died 01 Apr 1693, in Perquimans Precinct, Albemarle, NC, whose son is Robert Francis Beasley. It's unlikely this catholic Francis Beesley would have hung around Lancaster where the Protestants could torture him at any time they felt like it. In 1842, Barclay's Complete and Universal Dictionary described Lancashire as "...a county of England, lying on the Irish Sea, and bounded by Cumberland, Westmoreland, Yorkshire, and Cheshire. It is 75 miles in length, and 30 in breadth. However the meaning of the first unit of "Beesley" is much less easy to explain. The interpretation of most place-names is rendered more positive if the older spellings have been preserved, and in this respect, the Domesday Book is very much relied upon. Unfortunately "Beesley" is not included and the earliest reference occurs some 200 years later. It takes the form "Besley" which would not itself be very helpful were it not for the lucky coincidence that the name "Beeston" (West Riding: 2½ miles, South-West Leeds) provides a convincing parallel. In the Domesday Book (1086) it appears as "Bestone" and so it is not too fanciful to assume that had "Beesley" been included, it would have appeared as "Beesley". Working backwards and following the established patterns of development in word formation, it can be demonstrated that the Old English form of "Besstone" was "Beostun" so it must follow that "Besley" was in Anglo-Saxon times, called "Beos-leah". This preliminary unit (Beos-) is a very ancient expression and now survives only in place-names. It made its way into Anglo-Saxon from the Old Germanic word "Binuz" which now is preserved in Modern German as "Binse" meaning "the Rush Plant". "Beos" had several meanings but they all related to the notion of coarse grass, reeds, rushes, heath, and rough-grazing land. Reconstructing the place name, it suggested that "Beesley" was originally "Beosleah" and meant: "The open-space suitable for rough pasturage". At the time of the Domesday Survey it is quite possible that it was merely a field-name of no precise location, and that might account for its omission from that Record.